Frank DeLima's 25th Anniversary Show. FOUR of Frank DeLima's most popular characters share the stage with him this summer as the indefatigable entertainer presents his 25th Anniversary Show at the Captain's Table. 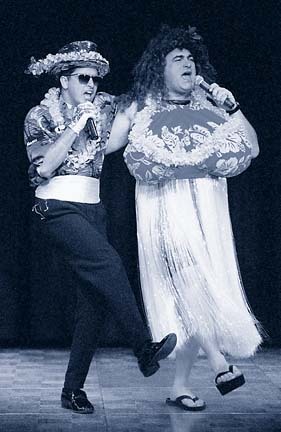 And it promises to be far different from the comedian's quiet debut at the Waikiki Marina as a Waikiki entertainer. Most of his local fans didn't discover him until several years later, when he started his long engagement at the Noodle Shop. They followed him to the Queen Kapiolani and the Polynesian Palace thereafter. The Captain's Table has been his home in recent years and the new show is a retrospective that includes a little of almost everything he's done through the years. Sumotori Lolobono dances a parody hula. Imelda reprises "I Left My Shoes in My Manila" and other big hits from shows past. Versatile Auntie Mary Tunta returns with last year's popular Ricky Martin parody, "Smashing the Cockaroacha." And there's more! "Would You Like to be a $5-aire" is his new audience participation number and features the 2000-Year-Old Chinese Man as the show's frugal host. It all worked perfectly as free-form entertainment on opening night last Saturday. DeLima was also in top form presiding over the ever-popular "Jun Ken Po" birthday segment. Impressions? DeLima doesn't look anything like Don Ho but he succeeds in capturing the singer's character both in broad strokes and fine details. DeLima-as-Ho is one of the most impressive segments in a show that ranks as one of DeLima's all-time best. 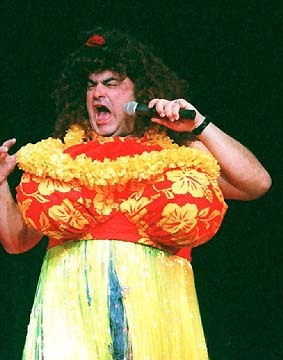 in this photo from his 1996 show. DeLima-as-DeLima is also enjoyable. The heart and soul of the new show is DeLima simply sitting on a stool and looking back over his 25-year career as a Waikiki headliner and 10-time Na Hoku Hanohano Award winner. The show could have been staged as a high-tech multimedia extravaganza, with video clips and still shots of DeLima and the various musicians who have worked with him over the years, but the simple staging and unpretentious presentation fits DeLima perfectly. DeLima begins it wearing an odd headpiece he describes as looking like "Portagee Godzilla" and wears it while singing a parody of "My Way" that Patrick Downes has reworked in to plea for mercy by a tilapia at risk. A tilapia? Only in a DeLima show. Once DeLima removes the headpiece, his sidemen David Kaua-hikaua (keyboards and sound effects) and Robert "Bobby" Nishida go all the way back to the "Portagee Fight Song," "Filipino Blue Danube" and "Don't Sneeze When You Eat Saimin." It's been a while since DeLima dusted off some of this early material and this is the perfect time for it. He recalls the controversy that greeted his song about Samoan giant "Abdullah Fataai," and how surprised he was when his non-comic recording of Patrick Downes' "Waimea Lullaby" won "Song of the Year" honors at the Hoku Awards ceremony in 1980. Among the newer "oldies" are "Glenn Miyashiro," "Korea" (Dave Donnelly's hostess bar parody of "Maria" from "West Side Story") and DeLima's biggest political number, "Bishop Estate Trustee." His long-time hit signature parody of "Lucille" is in there too. Add a couple of his favorite "Portagee" jokes, and solid support from Kauahikaua and Nishida, and Frank DeLima's 25th anniversary show is a fine weekend attraction in Waikiki.